The statement said that on this day of awakening, the people should remember the contributions of 2nd Lt. Malathy and recognize the fundamental changes the Tamil liberation struggle has created in Tamil society in regard to the equality of women. Marches, guest speeches and arts and cultural programs are to be held Friday at various locations in the Northeast, sources said. Meanwhile, on Thursday at 4 p.m., a function to commemorate 2nd Lt. Malathy was held in the Vanni. 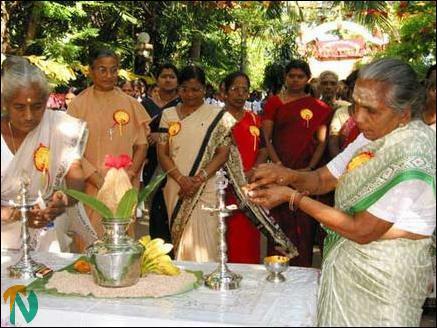 Ms. Thamilini, the leader of the LTTE’s women’s political wing, presided over the frunction. The leader of the LTTE, Mr. V. Pirapaharan also attended, sources in the Vanni said. Mr. Pon Thiyagam and Ms. Archana, the head and deputy head respectively of the Martyr’s office, and Ms. Sudarmahal, the head of the ‘Chencholai’ children's home, also participated. Ms. Kalyani of the Malathy brigade gave the welcome speech and Ms. Thamilini gave the keynote address. A book on the history of the Malathy brigade, with 11 chapters and 565 pages, was released at the event. The release was headed by Ms. Ulagamangai of Capt. Vanathy publications. Ms. Malaimahal of the Malathy brigade gave the introductory speech for the book.